Maressa’s Spokane Dance School, was founded in August 2011. We are located at 9411 E. 1st Street Spokane Valley, WA 99206. 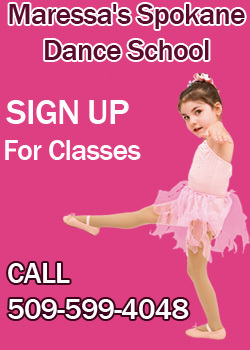 We offer many different types of dance classes. Ballet, Tap, Jazz, Lyrical, Hip Hop, Cheer/Drill Prep, Modern and more! Classes are available for children ages 2 years and up. We even have Mommy and Me classes. We also have many dance classes for adults. Ask about our Pilates class to give you a full body lift. There is a class for everyone at Maressa’s Dance School. We have classes for beginners all the way to advanced dancers. If you have never danced before, but want to have fun while getting a workout, come to Maressa’s Dance School, in Spokane, WA! We have a fun environment with awesome instructors who love to teach. At Maressa’s Dance School we welcome children and adults with special needs. The classes are kept small to give every student the individualized attention they deserve. Maressa’s Dance School specializes in ballet classes. We have beginner classes for all ages, even adults. Ballet classes for toddlers are also available. Your toddler will have fun while learning social skills, how to interact with peers, and follow directions. They will learn the basics of ballet while getting exercise. Tiny Tots ballet is a great activity for toddlers, and children with special needs are always welcome.